Trying to decide between Ocean City, Maryland or the resort beach towns in Delaware? There is a lot to consider. Are the beaches crowded? Type of dining options do you prefer? Is the beach clean with lifeguards on duty? How about the water quality? Nearby restrooms? Does it have a boardwalk and beach food? Are there things to do with the kids? Are there big waves, is the sand soft? Average weather and ocean temperatures? Here’s some unbiased feedback from seasoned vacationers. Although the beaches in Delaware are beautiful, I prefer Ocean City, MD. Northern end of OC, you’ll find lot of high rise condos and less hustle and bustle.. Ocean City has buses that run you all over for a very small daily fee, so you really don’t need to drive from place to place. I also enjoy the boardwalk tram, also vet cheap and kids like to ride it.So, I’m biased to Ocean City. It is clean, and safe and there are a lot of kid friendly activities, mini golf, amusements to enjoy. OC is huge beach town and exciting too. The kids love Ocean City, some claim that it’s loud, young, and too commercial. 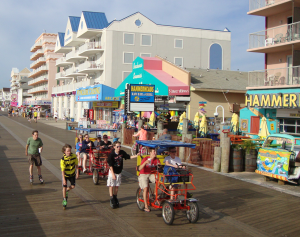 Ocean City has a larger selection of accommodations, more amusements, wider beaches, and longer boardwalk, etc. It’s a much bigger resort area with block after block of hotels & condos. Rehoboth has just a few hotels, more traditional cottages and vacation rentals, some just a short walk from the ocean. So, if a vacation rental is what you’re looking for, I recommend Delaware beaches. OC is a little too crowded & touristy for my taste. The beaches in DE are more quiet, family friendly and considerably more elegant. My vote is for Delware, and I’ll continue to refer people to Ocean City so Bethany and Rehoboth can stay small and quiet. 🙂 You should also look into Fenwick Island too, it’s the first beach town in Delaware on the DE / MD border. Small, quaint, clean and kid friendly. 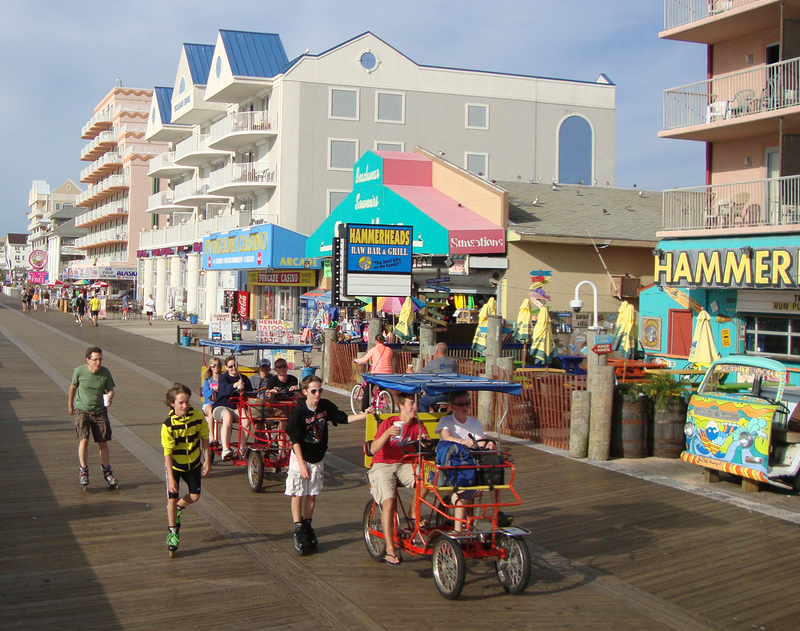 Ocean City is nine miles long, and the boardwalk goes from the inlet to 27th street. Traffic is usually busy but the traffic moves well with stoplights that are synchronized. The nine miles are less crowded than Coastal Highway area in Delaware… in my opinion. 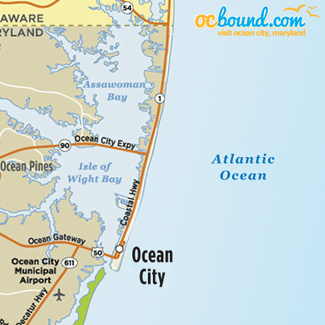 Also note that Ocean City’s nine miles are fully developed. From anywhere in Ocean City you don’t have to venture more than a mile from your location to find a variety of decent restaurants, mini golf, amusements, attractions, lots for kids to do in Ocean City, MD. For young family I would recommend Rehoboth Beach or Bethany. They all have excellent beaches and boardwalks. The Rehoboth Beach boardwalk is much smaller. Rehoboth has more upscale dining and Delaware offers tax free shopping. Also check out Bethany Beach, its sits between Rehoboth and Ocean City. It has a wonderful boardwalk and beach, quiet, and extremely family friendly. The beaches on Fenwick Island are nice and clean too, don’t overlook Fenwick. Overall, lots of options, you’re at the beach, where else would you rather be. For families with young kids, I recommend Bethany Beach or Fenwick Island, and Ocean City is a quick trip from both towns and great for a day trip. Rehoboth Beach is upscale, very pricey. There’s variety of amusements in OC for both young children and teens. Parking is expensive and scarce in Rehoboth (and Bethany as well), its much easier in OC. Dewey Beach is just south of Rehoboth, and tends to be a party crowd and full of 20 somethings and beach bars, not the best choice for young families to spend a vacation. Enjoy your vacation no matter where you go. Bethany Beach is nice place to unwind and relax, complete with a traditional boardwalk lined with beach shops and treats, it is the perfect place for a young. Your ultimate decision depends on what you like to do and what you enjoy. Different folks are attracted to different types of beaches, so if you want the best vacation, choose wisely.